With 4-6 banding stations as standard and up to 12 stations as an option, with central adjustment. Banding material is either polyethylene tape or kraft paper tape. Standard equipment with integrated feed pusher, safety light barrier and clear text display. The machine height is adjustable to achieve a variable height for the working plate. The slope of the roller delivery is also adjustable. All models are available either for delivery to the right or to the left side. 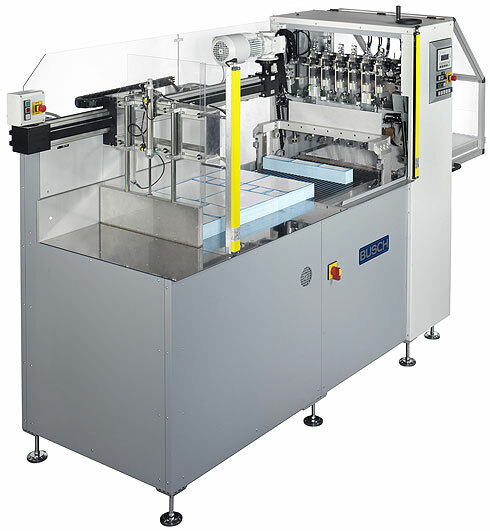 To make use of the high output especially of MB 74 and MB 104, it is advisable to place a combination of two guillotines in front of the multiple bander – to increase the output of the banded products.